Last month, I wrote about John Conyers resigning and Sander Levin retiring. Today, it's MSNBC reporting Utah Senator Orrin Hatch Announces He Will Retire At End Of Term. The Utah Republican, who has served four decades in the Senate, made the announcement in a video posted to Twitter. Will his empty seat pave the wave for Mitt Romney? NBC’s Katy Tur and Politico’s Jake Sherman discuss. Yes, Mitt Romney is one of the reasons I care about this news, as Romney was born and raised in Michigan. I even wrote about his high school years in Willard Scissorhands, the Barber of Severe, although I promise not to call him that should he run, win, and oppose Trump from inside the G.O.P. MSNBC also asked Will Mitt Romney Run For Senate? Mitt Romney has made it known he’s interested in the Utah Senate seat and polling has been favorable for him in the state. I'll let the Magic 8 Ball sum up the answer. In case anyone wonders who the likely Democratic nominee will be, Steve Kornacki showed her name on his screen -- Jenny Wilson, who came in second in the poll. That's the candidate I expect my middle sister, who lives in Utah, would vote for. As for likely primary challengers to Romney, pay attention to Mia Love, a U.S. Representative. She's the kind of candidate both Trump and Steve Bannon would support against Romney. A name that wasn't up there but might run would be the now retired Jason Chaffetz, who might be induced to throw his hat into the ring, especially if Love does not. 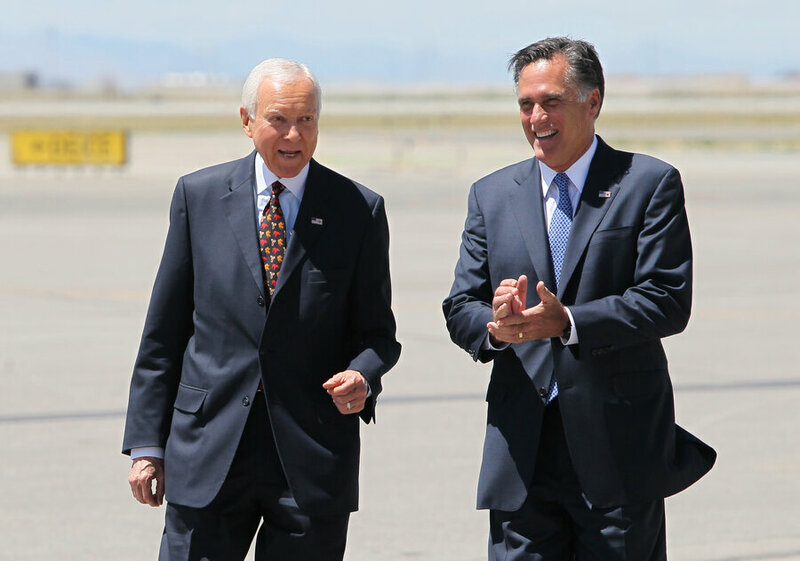 So far, I've mentioned two reasons for my interest, Romney replacing Hatch and my family's connection to Utah. The third is this WXYZ news segment, Bill Bonds confronts Utah Senator Orrin Hatch in 1991 interview, which I watched live. Legendary WXYZ-TV anchorman Bill Bonds confronts Utah Senator Orrin Hatch in this interview from October 1991. Hatch stormed away from the camera after being pressed by Bond on leaked documents. Like I wrote in the title, this isn't the first time I've seen Hatch leave. This time, don't go away mad, Senator, just go away.